The Executive MBA Program has been designed to deliver excellence in business education to middle and upper level managers in the private and public sectors. During the course of study, participants are guided through case analyses and simulations to ensure a quick transfer of skills and knowledge from the seminar room to the workplace with a special attention to the present and future needs of Saudi and foreign firms across the Kingdom. As a result, participants will quickly realize personal and professional benefits and their contributions will be recognized through greater responsibilities, promotions and self satisfaction. The rigorous program will enable participants to acquire the conceptual knowledge and improved decision-making skills to improve their on-the-job performance in an increasingly complex business environment. The Saudi economy continues to play an increasing role in the global economic affairs, especially after Saudi Arabia has joined the WTO in the last few years. This has increased the need for competitiveness among Saudi firms, which are continuously seeking to recruit distinguished managers or have increased budgets to raise the abilities of their managers to excel in a dynamic business environment. The program would provide an opportunity to managers and entrepreneurs in the local community to enhance their managerial knowledge, skills and expertise and thus contributing to the ongoing economic and human resource development activities. The Proposed EMBA program provides a unique learning opportunity for highly motivated business executives, mid-level managers, and professionals to earn an EMBA degree without interrupting their careers. • Let them deliver concrete business value to the Saudi economy, its corporate sectors (both private and public) and the nation at large. • Enhance the general managerial capabilities of participants by building upon the core functions and disciplines of business administration. • Strengthen the leadership, creative and teamwork skills that would sharpen the participants’ competitive edge, and add value to their organizations. The program is composed of a total of 42 credits delineated over 5 clusters/modules to be offered over 4 semesters. This excludes the pre-requisite foundation module that covers Math and Computer skills, and which is given at the beginning of studies (for zero credit). Lectures are scheduled on weekends twice per month. The degree requirements can be met in 21 months of study as participants follow a full load of courses offered in sequence. The EMBA program is a cohort based program, whereby students admitted into a class (cohort) will begin their studies at the same point of time; take the same sequence of courses (consisting of 42 credits) throughout the 21 months program period, and graduate at the same point of time. A typical FBSU's EMBA class will consist of 33 students. Class sessions will be conducted every other weekend ( Friday and Saturday) from 9 to 6 p.m. Prayer break with coffee, and lunch break​ separately provided. As the class meets as a cohort, students will strengthen their networking bonds by taking the curriculum together in the same sequence. Admission to the program is based on a combination of academic and professional criteria. These include competitive GPA, English proficiency as well as relevant work experience in a managerial/supervisory capacity, supportive references and successful face to face personal interview. To hold a Bachelor’s degree in any field from an academic institution accredited/recognized by KSA’s Ministry of Higher Education (MOHE) with a minimum ranking/ classification of “Good”. 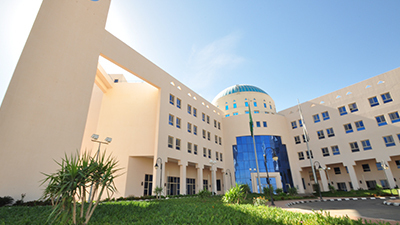 If the Bachelor’s degree was awarded outside the Kingdom, the certificate must comply with the equivalence requirements set by the MOHE’s University. Graduates of recognized military colleges/universities must complete 30 pre-requisite credit hours with a minimum rating of “Very Good” before they can join the program. To have a minimum of three (3) years of work experience at a managerial / supervisory position (middle or upper management) that entails the tasks of decision making and supervision of employees. Professionals such as lawyers, medical doctors or engineers who are running their own practice for at least three years would be considered as managers. To achieve a minimum score of 5 on the IELTS exam (500 in TOEFL or its equivalence) OR score a minimum of 70% on the University’s English placement exam. Applicants need also to pass a personal interview with the EMBA Program Director to determine the potential for contribution to class activities and ability to graduate. The program accepts candidates on a competitive basis. NOTE: The program accepts applications for admission year round. Students who satisfy all the admission requirements start at the beginning of the academic year (Sept.). Applicants who are weak in English can normally start their English studies in the first or the second semester, if the program is offering foundation English courses. Please submit your application along with the required documents to the Office of the Registrar’s Office. Costs to students in tuition and other university fees, are kept at a minimum consistent with the provision of high quality instruction and adequate facilities and equipment. The program fees at 95,000 SR after the University discount. This fee will cover tuition only. It does not cover the costs of textbooks, laptops, nor the business study trip to foreign destinations. Payments can be made in instalments.